We learn our native tongue through constant use. We are surrounded and encouraged daily as a child to make sounds and put words together, even if they don’t follow correct grammar! To master the language of music, we need that same daily practice, encouragement, and immersion. A child doesn’t learn to say “mama” and “papa” in the same day. How many times did the parents say those words to the child before he or she uttered something close to those sounds? Find a sound or progression you would like to make part of your improvisation vocabulary and practice it daily. Do you have a keyboard at home? Play your chosen sounds every time you walk by it! We learned the grammar of our spoken language not because we learned the rules but because we heard them applied every day. A three-hour session on Saturday afternoon will not have the same lasting result as a few minutes everyday. Sure, we can make progress in a long session, but we learned our language through daily practice. We should do the same to master the language of music. 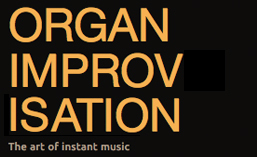 This Saturday, I will present a workshop to the local Baltimore AGO on improvisation. If you are in the area, feel free to drop in. We’ll be at the Cathedral of Mary Our Queen from 9:30 to 12:30 on October 14. After an opening presentation on looking at improvisation as conversing in the language of music, there will be time for questions and willing volunteers to sit on the bench and apply the ideas. I will also be attending the AGO Pedagogy conference next week at the University of Kansas in Lawrence. With a focus on organ and improvisation study in the French conservatory system, I hope several of you are planning to attend. Please say hello if you see me there! Hoping you speak music daily! This entry was posted in Newsletter and tagged AGO, Baltimore, Cathedral of Mary Our Queen, masterclass, Music as language. Bookmark the permalink.